This is for ONE Diaper Cake Mini! If you add a bow girl characters will have a ribbon bow, boy characters will have a ribbon bowtie. If you prefer one style over the other please put in notes to seller if you would like them to be a bow or a bowtie. YOUR ITEM WILL NOT SHIP UNTIL YOU TELL ME THE ABOVE INFORMATION!!! I WILL NOT BE RESPONSIBLE FOR ANY DELAYS THAT THIS MAY CAUSE! YOU WILL NOT RECEIVE A REFUND AND YOU WILL BE RESPONSIBLE FOR ANY EXPEDITING SHIPPING FEES IF WE HAVE TO EXPEDITE SHIPPING! Three tier diaper cake is not included. Banner is not included. Sold separately. Express 1-2 day does not rush your order. This only means that once your order is completed we will ship your order express 1-2 day mail and not fedex or priority mail. If you need a rush order you must contact us prior to purchasing to see if we can accommodate your timeframe rush order fees will apply. Three tier diaper cakes are sold separately. Please message me for pricing! 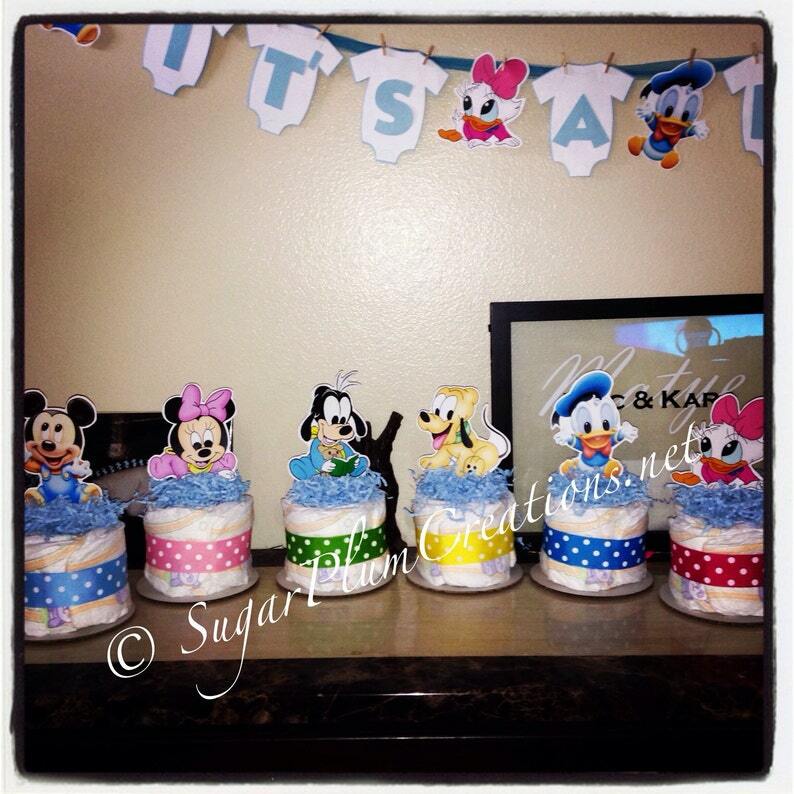 These can be made for kids birthdays also. Please message me for details and pricing! Additional shipping fees will apply for shipping to Hawaii, Alaska, Puerto Rico and anywhere outside the United States. Message me for a shipping quote before purchasing. Thank You! This product is not a licensed character product. You are paying for my time to put together. Any licensed characters used are copyrighted by the original owner. 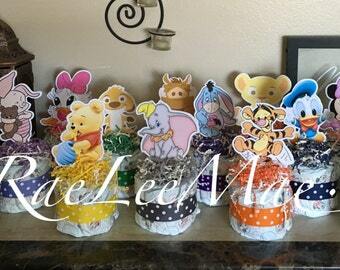 RaeLeeMae was the first seller on etsy to sell these diaper cakes and the Lion king diapercakes and decorations. All others are copies. We were originally known as SugarPlum Creations. But due to others using our photos and creations and trying to claim as their own we had to incorporate our business and hire an attorney and completely restructure. If you see other sellers using our photos or selling our items please let us know. We take great pride in our work and coming up with new and unique ideas so should everyone else. Rest assure when purchasing from us you will receive the highest quality product. We only use brand name items and only items that we would use on our own babies.